So the story goes like this. Cat is still considered enemy#1 by many, and this book’s villain “du jour” is a ghoul named Apollyon who intends on starting a race war between vampires and ghouls. He’s promoting Cat as the reason for needing to battle, stating that her many “weirdnesses” (she’s never been a typical vampire) will have a devastating effect on Ghouls, with the potential to enslave and control them all. Thing is, we find out Apollyon’s got a long history of causing such uproar, and well, there’s always more to the story, now isn’t there? Cat is still coping with her ability to absorb certain “skills” from the blood of other paranormals. She’s extremely powerful… in spurts, and not very good and wielding the powers she drinks in (literally). I’d thought changing from a half-breed into a full vampire meant an end to my uniqueness, but fate thought differently. 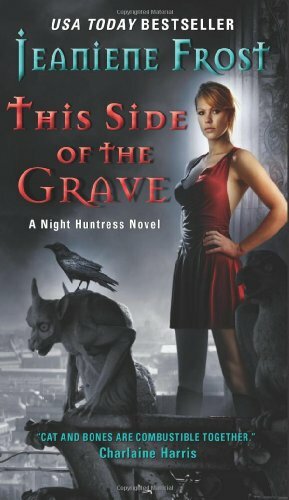 I woke up on the other side of the grave in possession of two things unprecedented in vampire history – an occasional heartbeat and a craving for undead blood. The side effect of the latter meant I temporarily absorbed power from the blood I drank, much like vampires absorbed life from human blood. That was all well and good, but if I drank from a Master vampire, I also temporarily absorbed any special abilities that Master had. This was great when it came to enhanced strength, but not so great when it came to other abilities that were out of my depth of control. This secret she carries could be very detrimental in how she is perceived by other paranormals (possibly even her own kind), and especially one in particular that makes us wonder who the real villain is. So here she is, stuck in yet another mystery to solve (good for us, not so much for her), and another battle to live through (let alone win). She begins to come to terms with the fact that her undead life is always in peril, and her time in this world, is limited. This new outlook has her examining her loved ones differently, realizing that she should not take her potentially long life for granted, appreciating her time with them. She slowly changes focus on what’s truly important, opening herself up to real connections. He wasn’t just stronger than me physically or in power abilities. Bones also left me in the dust when it came to inner strength, daring to show his deepest vulnerabilities without any fear, safety net, or rationalization. And it was high time I followed suit. Sure I’d bared my heart to Bones in the past, but not nearly enough. He knew I loved him, knew I’d fight to the death by his side if need be, but there was more to it than that. Maybe some hidden, fragmented part of me had feared that if I admitted to Bones how much he truly meant to me, then I’d be acknowledging to myself that he had the power to destroy me more thoroughly than anyone, even Apollyon or the vampire council, could. All the rest of the world could only kill my mind and body. Bones alone held the power to demolish my soul. From the many close calls on her life since meeting Bones, she realizes being “undead” doesn’t mean she’s completely immortal. Her new paranormal body may be harder to kill, but her mostly unbeating heart still feels very human to her. And while it may still need guarding, she realizes she’s been guarding it against the wrong people. These are the moments I enjoyed most in the book. A momentary crisis of consciousness, Cat’s self-analysis as she contemplates who she was, who she is becoming, and who she really wants to be. Killer, yes, but that was the smallest part of him in my eyes. I was a killer, too, but he gave me hope that I could learn to make it the smallest part of me, even if it was necessary in the world I’d chosen to live in.